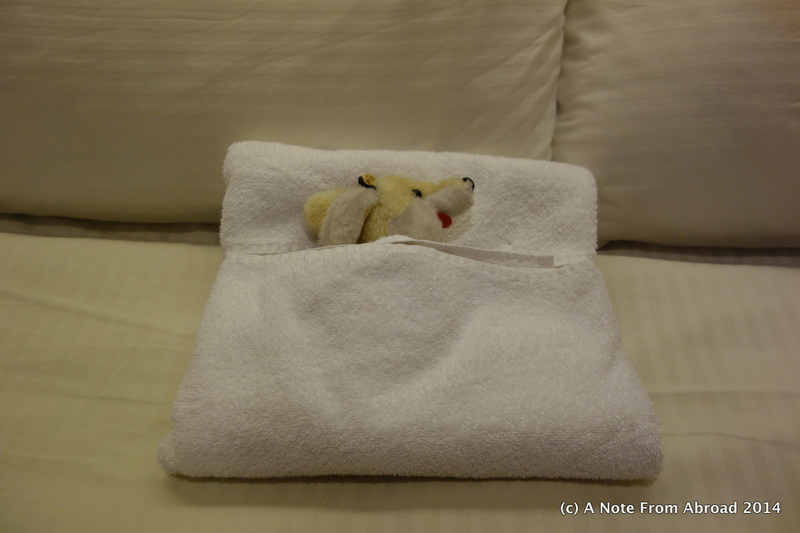 We are still on board the Ruby Princess as we make our way around the British Isles. Feeling sluggish today, we took our time getting our act together and did not leave the ship until 10:00. But before we left, Tim arranged for Gus to get some sun. Princess had shuttle busses that left every few minutes for the 20 minute trip from the port into Dublin. They charged $16 per person round trip which I thought was a little steep, but it was convenient. I have been going through Internet withdrawal due to almost zero service on-board the Ruby Princess. When we can get online, it goes in and out, and is never strong enough for me to upload pictures. In an effort to appease his wife, Tim made it his mission to try to remedy the situation. First stop was Vodaphone where we purchased a mobile hotspot for €39.99. It is only 3G, but will allow up to 5 devices to be hooked up simultaneously. It included 30 days service and 7 GB of data. This can be used only in Ireland, but we plan on coming back to spend more time here at the end of the cruise. Still not satisfied that was enough, Tim went next door to Three.ie and purchased 2 data sim cards for our iPhones. For only €20 each we have 4G with unlimited data for 30 days. This card will work not only in Ireland, but in the UK and in some of the major cities throughout Europe. We can now use our iPhones as a “hotspot” and I can link either my laptop or iPad as needed. We think that was a great find! Trinity College is the premier school in Ireland. 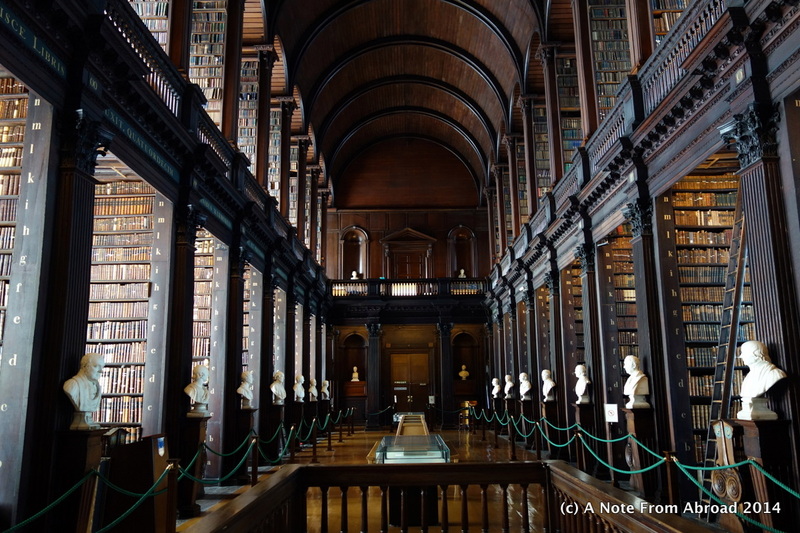 They offer a student led tour that lasts 30-40 minutes and ends where the line begins to see the famous “Book of Kells”. The tour itself only covered the three main squares, but did fill us in on some of the history of the school as well as some local lore. The campus, like the town, is a contrast of ancient and modern. One of the sculptures reminded us of another by the same artist we had viewed at the Vatican Museum in Rome. Arnaldo Pomodoro, an Italian, has created several of the golden sphere sculptures, with the original done for the Vatican. In addition to the one here at Trinity College, the others can be found at The United Nations Headquarters in New York, The Hirshhorn Museum and Sculpture Garden in Washington, D.C., Christian Theological Seminary in Indianapolis, the de Young Museum in San Francisco, Tehran Museum of Contemporary Art, American Republic Insurance Company in Des Moines, Iowa, and at The University of California, Berkeley. 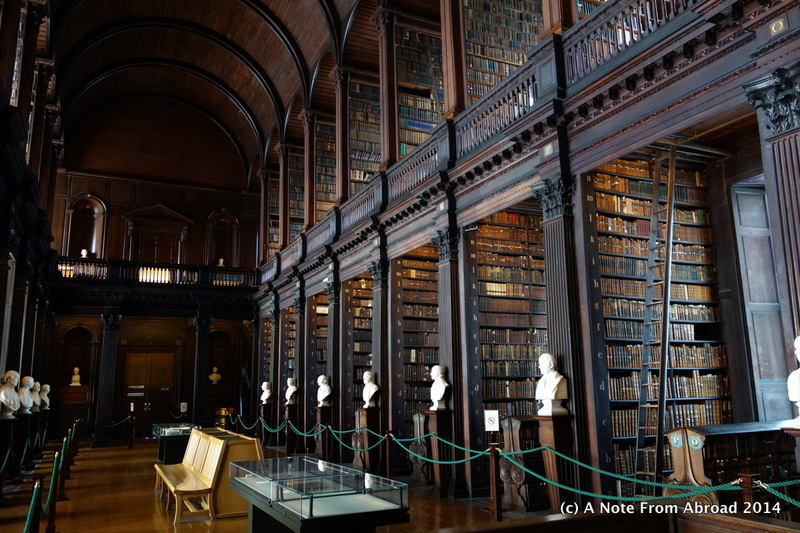 The Book of Kells is believed to have been written about 800 A.D. and contains the four Gospels of the New Testament. Written on calf skin, it is protected behind glass and in a darkened room. Only two of the four volumes are on display. No photography was allowed in this section, so I am borrowing two pictures off of the Internet. Old Library and Long Room. The library itself houses approximately 5 MILLION books, but the Long Room is the highlight with 200,000 of the libraries oldest books. Marble busts and old banners line the room. The World Cup has been big on board and the open-air theater under the stars was a great place to watch the soccer matches. 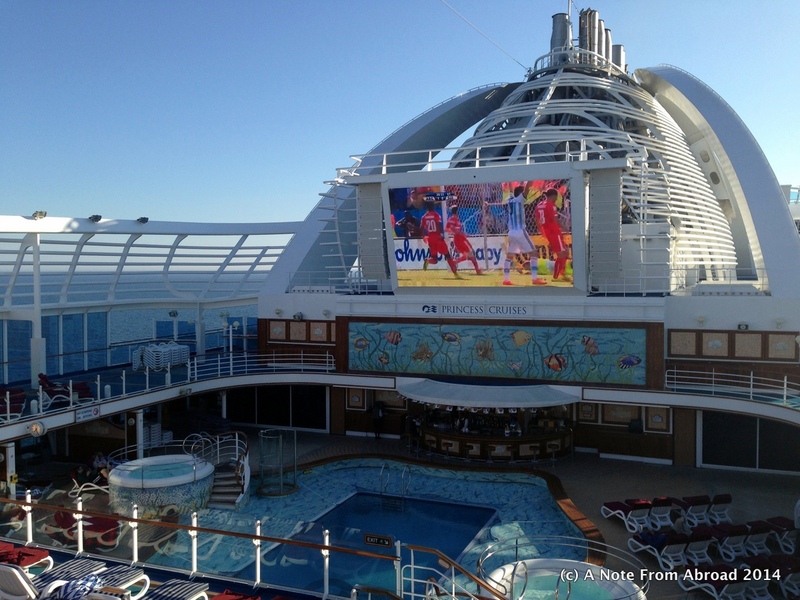 A great place to watch a movie, or in this case a soccer match. 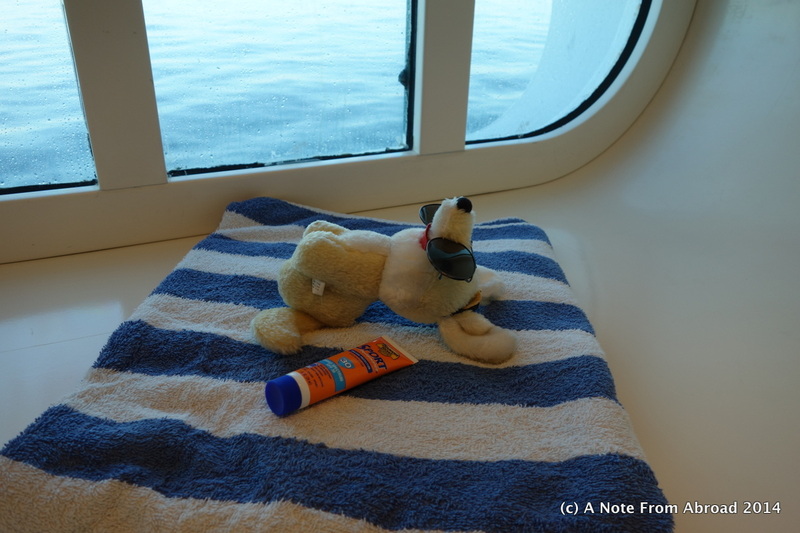 In case you did not have a chance to read our last post that explains what is going on with our cabin steward, “D” and our furry friend, Gus, you can find out by clicking here. Gratitude Moment: Today I am grateful for my love of books. They have given me great joy, hours and days filled to the brim as I lost myself between the pages. They have developed my imagination, added to my knowledge, and provided many a pleasant experience. Through my reading I have explored new places on this planet or on imaginary ones, solved mysteries, fought demons and dragons, been carried away with romance, held my breath at critical moments, laughed until I cried, and cried until I had no tears left to shed. They have brought new friends into my life through book clubs, and strengthened existing friendships through sharing our favorite novels. Have a comment, or just want to say hello? Leave us a message in the “leave a reply” section at the bottom of this page. We love hearing from you! Please add your email address if you would like to subscribe to our blog and receive a notice whenever we add an update. We would love to have you join us! 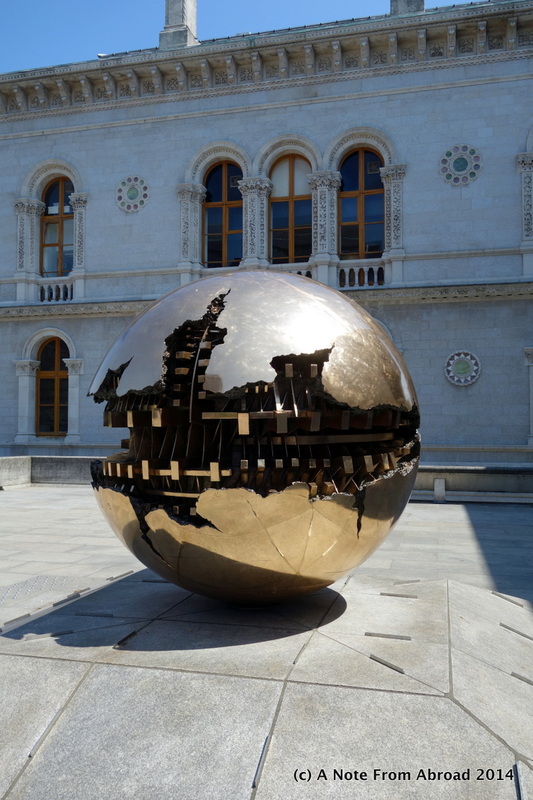 This entry was posted in Europe, Republic of Ireland and tagged Book of Kells, Dublin, Gus, Photography, Republic of Ireland, Sphere within a sphere, Travel, Trinity College. Bookmark the permalink. Sure can identify with the wonderful worlds books bring us. I have a Nook, but remain a diehard fan of real books. The pix of the Trinity library did leave me wondering tho how many of the gazillions of old tomes actually get accessed. Mike, I too tried the digital book route with a Kindle. I love being able to have a library at my fingertips, especially when traveling, without having to lug a lot of weight. But when I am home, having an actual book in my hands is my preference. I’m curious as to how monthly fees are affected by using your Iphone abroad? Gus and I had the same idea today. We replace our SIM cards when we arrive in a new country and gets 30 day prepaid plan. There are a lot of different carriers. Each country is different. We have used Vodaphone in several countries now. You must have an “unlocked” phone to be able to change out the SIM card. The newer iPhones are unlocked.